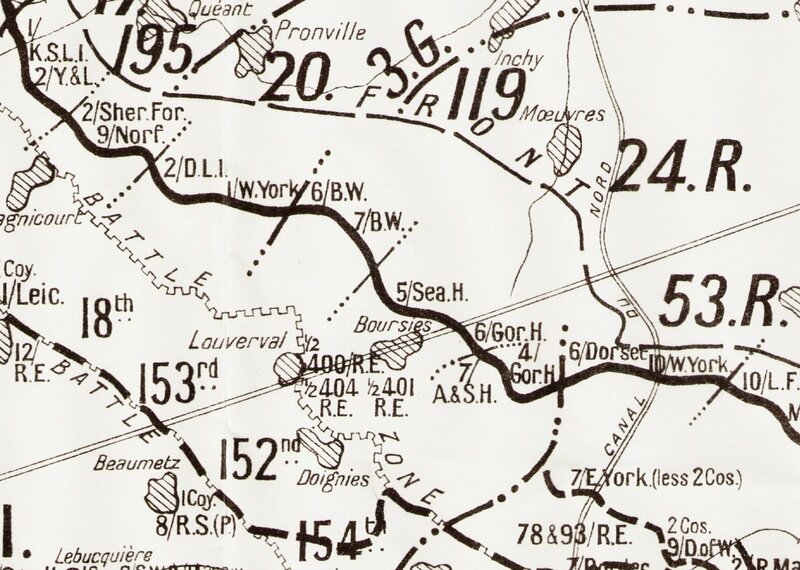 I have attached a map from the Official History showing the opening situation on the 21 Mar 18 when German units attacked the 51st Division, coming over the ridge at Louverval and then onto Doignies. I would be grateful for further details of their attack (I have copies of the British diaries of the 51st Division and their Brigades, with their histories). I would like to know more about the specific German units(s) actually involved - and whether anyone can help with official, or first hand, German accounts of their assault. Machine gun detachments were covering Doignies, but I think most of these were lost in the heavy artillery fire. A Siege Battery section (57?) was just south of Doignies and a section of 122nd Heavy Battery were located between Beaumetz and Doignies. After destroying their guns (their horse teams were lost to heavy fire) the Gunners withdrew in the face of direct machine gun fire. I am interested in any reference to the guns, but also in German descriptions of the battle. The other two infantry regiments, IR 58 and RIR 46, also have printed histories which are unfortunately not online. Many thanks Charlie for your speedy response and the link you suggested, plus the other detail, I will go to the link to read more! I checked both regimental histories. RIR 46 was to the East of Louverval. 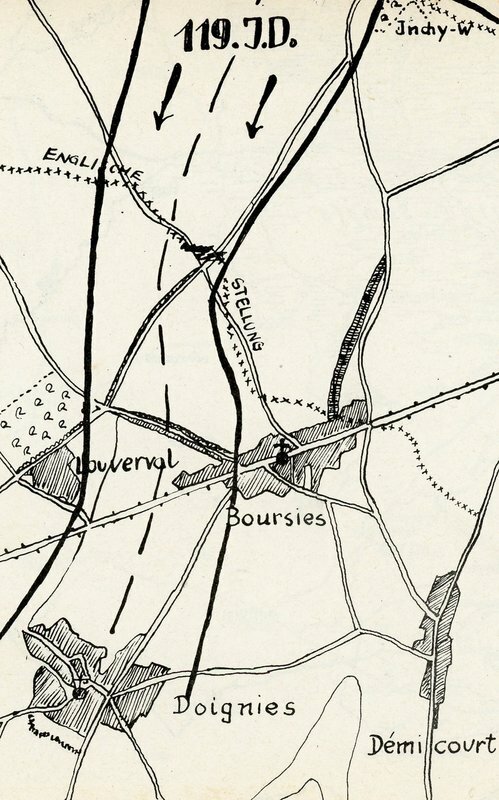 Louverval was within the sector of 3. Garde-Infanterie-Division and was captured by Garde Füsilier-Regiment (they mention it in their regimental history). IR 46 was further to the East. Doignies was captured by RIR 46 (two British guns were taken) and towards Beaumetz, Garde Füsilier Regiment mentions capturing 6 guns. Firstly many thanks Jan for your additional detail. From the British (5th Seaforth Highlanders - who were in trenches in the area around Boursies, Doignies and up to almost Louverval itself - and 51st Highland Division) records it seems that German units came over the ridge just above where the Louverval Memorial and Cemetery now lies, swept over the Bn HQ, and set up machine guns to cover towards Doignies and the position just to its rear where 122nd were. 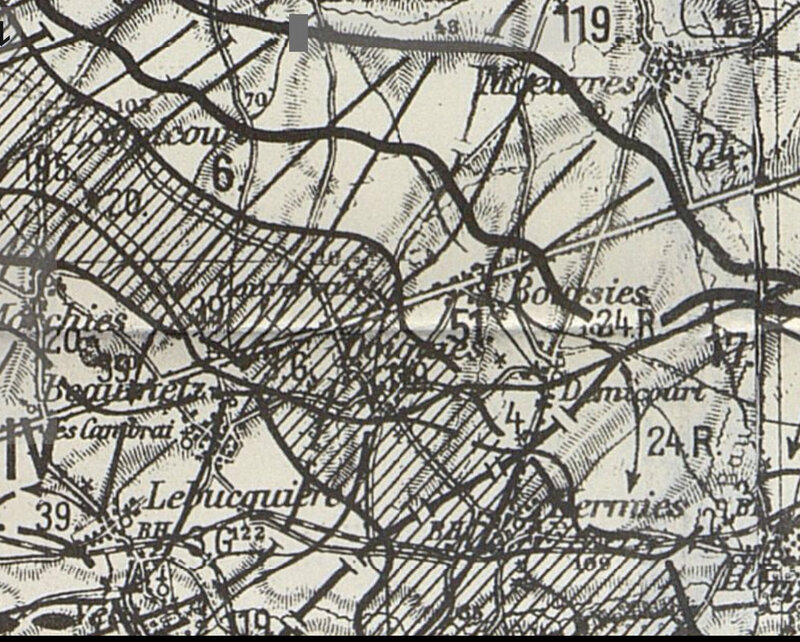 The German infantry then swept down the trenches towards Boursie & Doignies forcing the remnants of the 5th towards Hermies. So this, I suspect, comprised IR 46 who were (assumed) using the Bapaume/Cambrai road as their (inclusive) boundary. If this logic is correct then Garde Füsilier Regiment were to their right and took the small hamlet/chateau of Louverval itself before then moving on just to the right of IR46 and towards Beaumetz itself. (It's also possible they took the area where the Memorial is and provided the MG fire towards Doignies, in effect covering 46 IR's attack.....). The fighting continued in the area for a while. I am surmising that IR46 took the two siege guns of (57?) SB. I don't know if they had been destroyed. These were just on the outskirts of Doignies. If correct the Garde Füsilier Regiment took the two guns of the 122nd HB (60 pounders) and possibly the other 4 were siege guns sited in Beaumetz. Do you know who has the copyright for the History of 46 IR please? My history of the 122nd is intended to include reference and imagery of their German opponents and also to ensure any copyright is properly sought/attributed wherever possible. The copyright is/was held by Bernard & Graefe, Berlin 68, Alexandrinstraße 134. The section was on the kink in the track between Doignies and Beaumetz a few hundred metres South of the G in 3G. They were actually V Corps Heavy Artillery, the flanking corps defending the Flesquieres Salient; the guns were firing from this flank onto German positions opposite Hermies. The remainder of the 122nd HB were in dispersed section positions, just to the SE & SW of Hermies. Your help is greatly appreciated, as is the suggestion of copyright holder. By a sad coincidence, a later Battery Commander, Major R H Johnson MC, now lies in Louverval Cemetery, just across the field from the lost section's position (he was not then with the 122nd ) having been killed in the later Canal du Nord Battle of September 1918, whilst on a forward recce. I've added the Skizze from RIR 46. RIR 46 was on the right (=West) of IR 46, 3. Garde Infanterie Division on the right (West) of RIR 46. RIR 46 specifically mentions capturing two guns at Doignies. IR 46 didn't enter Doignies as they describe in their regimental history. AND: IR 46 is not the same as RIR 46!!!!!!!! They were in the same division, which makes things complicated for people who don't fully understand the German army composition and names etc. Therefore they themselves usually refer to IR 46 as "Regiment Kirchbach" (after its official title) to make things easier to understand. On the skizze, the western half of the divisional sector was for RIR 46 (Reserve Infanterie Regiment 46) and the eastern half for IR 46 (Infanterie Regiment 46 = Regiment Kirchbach). Thank you also for clarifying RIR/IR - it's consoling to note that it is not only the British use of nomenclature which can make things confusing. It's not the first time I've come across 'inaccurate' information in original histories etc., not at all surprising though given the intensity of fighting & impact of events on subsequent memories. IR 46 didn't enter Doignies as they describe in their regimental history. The skizze is much appreciated. And just to clarify, in addition to the section of 122nd Heavy Battery in position between Doignies and Beaumetz, the other section of two guns (just a few hundred metres South of Doignies) were indeed from 57th Siege Battery. I suspect the guns were not rescued (but I don't know this); so they are most likely to be the ones which are referred to in RIR 46's history as being captured.